It doesn’t take much to add value to an organization, especially when it's running on SAP Business One. In the recent webinars such as The Best of What’s New in SAP Business One 9.3, Vision33 covered some of the many new features added to the latest version of SAP’s flagship enterprise resource planning (ERP) solution for small to midsized enterprises (SMEs). In keeping with the theme of useful features within SAP Business One, let’s turn our attention to some of the often-overlooked features within SAP Business One that can help your business fully leverage your investment (or future investment) in SAP Business One. Here you can see a list of stored languages and translations for a term that you have stored. From the drop-down list you can add new language translations , and although it doesn’t translate automatically, you can just as easily type a word into Google translate and then copy and paste the translated term back into the form. You can add it into a quote or order, and it will be stored in a table; this is especially helpful for businesses that are expanding their operations into a new market overseas to ensure that users can work efficiently with a system that speaks their native language. If an inventory item requested by a customer is sold out, users can instead leverage other inventory on hand which would provide a suitable alternative for your customer. Under modules, click Sales – A/R, then Sales Orders. Start by creating a customer sales order. In the item number field, users can key in item Number field that has some alternate items that are predefined. To access the alternate items, users can press Ctrl+Tab on their keyboard to prompt the Alternate Item Selection Criteria. So when you run out of an item, prompt a list of substitute items that a customer may want to consider. Alternate items are very effective to ensure that you've optimized a customer’s satisfaction if your company is sold out of a popular item. Further, you can see the number that is in stock and customer specific pricing as well as a match factor. Once you select an alternate, it will return it into the sales order. The way Alternate items are set up in SAP Business One is within the Item Master Data. Right-click the mouse on the form of an item and select the Alternate Item menu option to easily create your list of items. The next feature we’ll look at starts in Sales Orders once more, and will enable users to hard-allocate inventory. Keep in mind this only works for items where there is batch or serial control enabled. From the quantity field, press Ctrl+Tab once more. This time, however, SAP Business One will prompt a list of serialized inventory. It tells the user if any of the items in question has been already allocated to other orders and then you can select the serial numbers that you want to allocate to the order. Then you will have allocated the item specifically to the customer on the sales order; this gives you the ability to tag inventory quickly to specific customers. Inventory allocation is also recorded in inventory reports. Under modules, go to Inventory > Inventory Posting List>Serial Number Transaction Report. Select the group of items from the drop-down menu, and then you can see the allocations by order number giving business users greater visibility into your inventory at a glance. 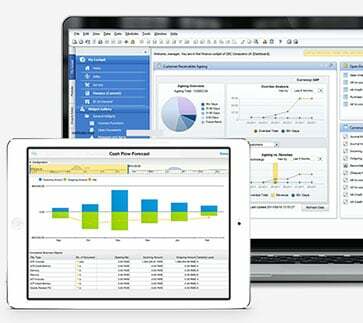 Did you find any of these hidden SAP Business One features useful? Leave a comment below and tell us if there are any other features that you’d like to see covered on Vision33.com. 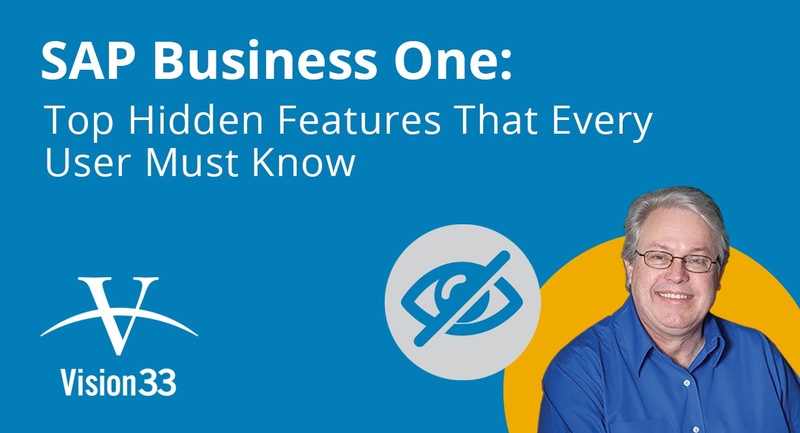 In the meantime, watch our recent webinar video recording titled Top 10 hidden features and Unique Functions in SAP Business One – hosted by Vision33’s SAP Business One Ambassador, Carl B. Lewis. The useful video covers a lot of ground describing ten hidden SAP Business One features and may very well answer some of the burning questions you may have about SAP Business One!